A prominent artist, listed in “Who’s Who in American Art 1995 – Present”, Plevin graduated from Ohio University in Athens, Ohio. Plevin also attended the Cleveland Institute of Art, the Cooper School of Art, and studied with prominent local artists until she adapted the instructor’s theories and concepts to her own purposes. Plevin works with acrylics, watercolors, and pastels. She also makes monoprints and etchings. Her style and sensibility have often invited comparison to the realism of nineteenth century American still-life painters. Her goal is to communicate her personal vision by rendering what she observes in her daily life. Plevin owns and directs the Gloria Plevin Gallery in Chautauqua, New York, an area that has provided major inspiration for her work. Chautauqua is also her beloved summer home. Commenting on Chautauqua, Plevin says “For over ten years scenes of Chautauqua have been a part of my explorations in paint, pastel, and etchings at all seasons of the year.” In 1993, Plevin had a solo exhibition at the Butler Institute of American Art in Youngstown, Ohio entitled Gloria Plevin: Chautauqua Still Lifes and Vistas. 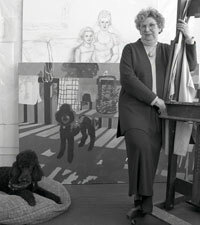 Her work can be found in numerous local, private, and corporate collections.